I have been craving all the briny things lately. Kalamata olives, tapenade, capers even, and pickled everything. Trader Joe’s started carrying spicy quick-pickled vegetables in the refrigerated section, and I’ve been enjoying those with hummus or avocado on toast. Also on salads, or just plain. Did I mention that I’m really into the briny things lately? 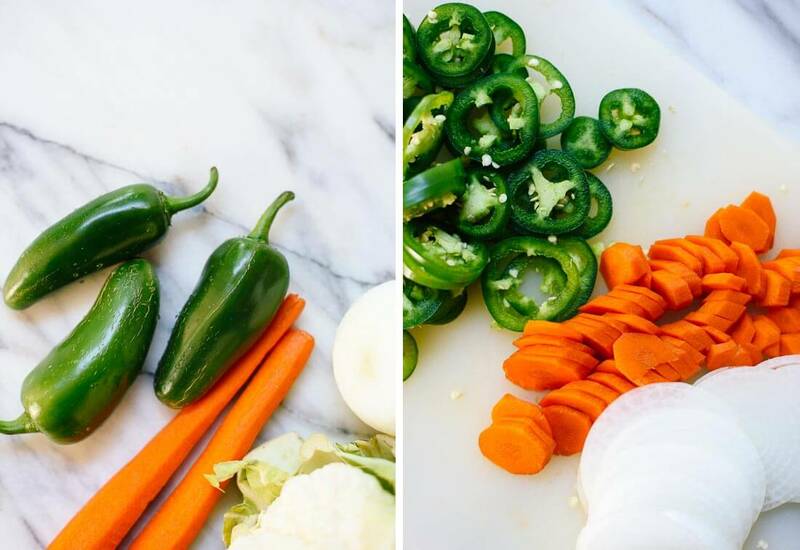 These pickled vegetables are modeled after traditional Mexican jalapeños en escabeche, an amazing pickled carrot, onion and jalapeño mix that you might receive with your order at a Mexican restaurant (if you’re lucky). I tried several recipes when I was recipe testing for the cookbook, but couldn’t get them quite right, so I gave up. Trader Joe’s version inspired me to give them another shot, and I’m pleased to report that I’ve finally figured them out. Funny how it’s easier to think straight when cookbook deadlines aren’t looming. 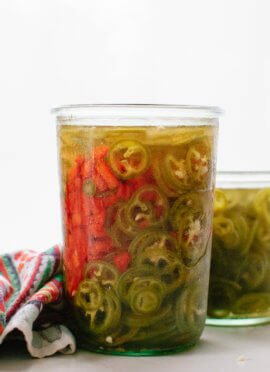 Unlike traditional jalapeños en escabeche, which are often cooked in some oil, I used just vinegar, water and spices. These pickles are fresh and light additions to any sandwich, salad or dish that needs a punch of briny flavor. 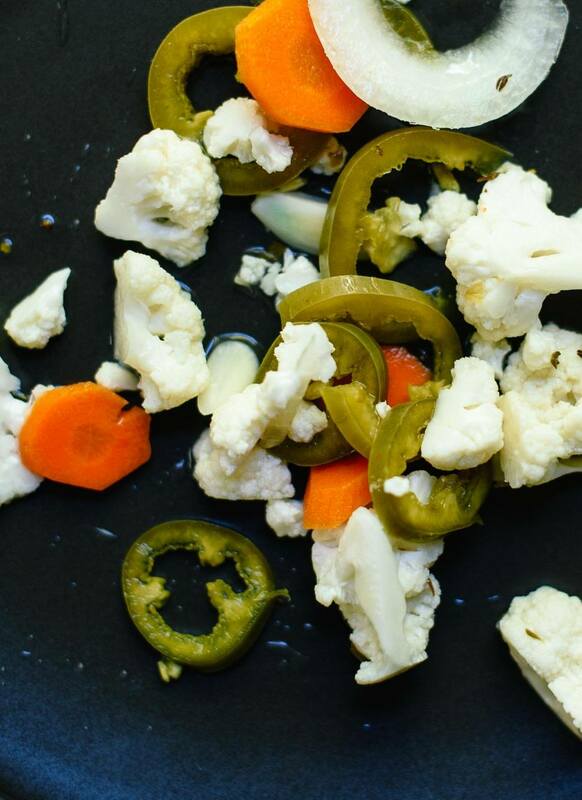 Learn how to make spicy quick-pickled vegetables (jalapeños en escabeche)! They are so easy to make. Pickled veggies are great on salads, sandwiches and other dishes. Recipe yields 1 quart pickles. 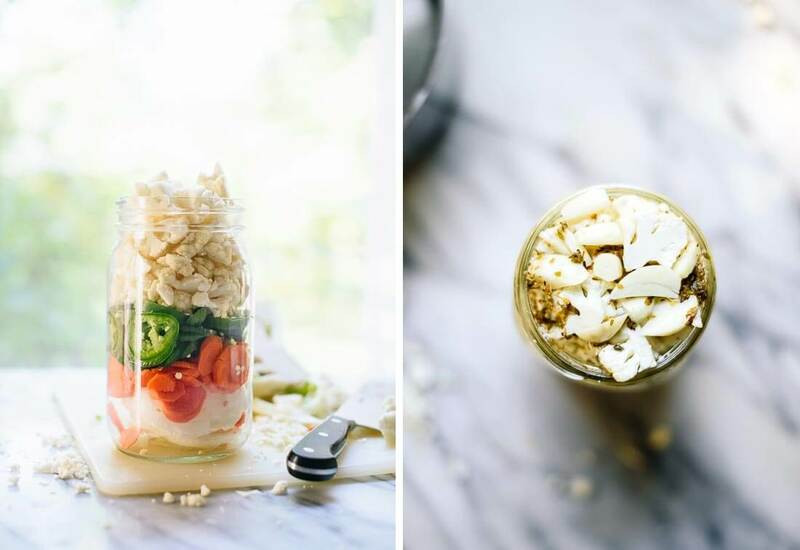 Pack the cauliflower, carrots, onion, jalapeños and garlic into a quart-sized wide-mouth mason jar. Place the jar in the sink, since you’ll be pouring hot liquid into it soon. In a medium saucepan, combine the vinegar, water, salt, honey, bay leaf, oregano and a generous amount of freshly ground black pepper. Bring the mixture to a simmer over high heat, then carefully pour the hot vinegar mixture into the jar. You should have enough to completely submerge the vegetables (and maybe a little extra). Tuck the bay leaf into the side of the jar. Let the pickles cool to room temperature (about 1 ½ hours) before gently tapping the jar to remove air bubbles. The pickles should be pretty well pickled and ready to consume at this point. If you’re not eating them right away, securely fasten the lid and refrigerate for up to a month. Recipe inspired by Trader Joe’s spicy pickled vegetables and adapted from my quick-pickled radishes. Note on canning: I have not tried canning these in a water bath for long-term storage (I wouldn’t even know how to do it). I’m not sure these would store safely for later, so I don’t recommend doing it. I have wanted to try pickling veggies for so long. Why haven’t I? You make it look super easy. Can’t wait to try it. It is really so easy to do. Hope you’ll give these a try, Karen! These look wonderful, and I totally get what you mean about getting to the end of a massive project then having a sudden burst of inspiration and creativity! And you can never go wrong with hacks for homemade Trader Joe’s favourites. Right?! I had never thought to pickle my own ginger, but that’s such a great idea. Thanks for sharing! You’re using canning jars for this recipe. Can this recipe be hot water bath canned, or will the veggies become too mushy? Hey Brent, I just used canning jars because they’re available in standard sizes and a good storage vessel for the fridge. I really don’t know enough about hot water bath canning to advise if you can can these safely. 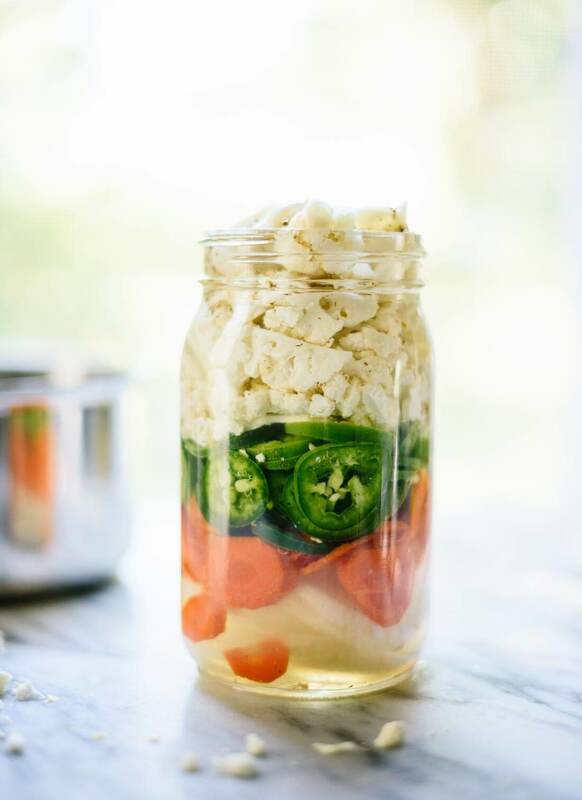 I have been experimenting with pickled vegetables lately, and your recipe looks absolutely delicious! I will be trying this recipe very soon! Awesome! Please let me know how you like the pickles, Dayna. 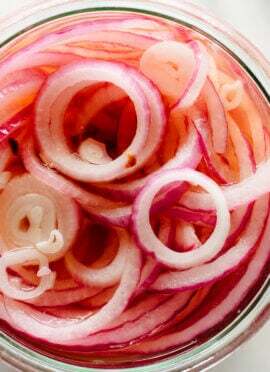 I love pickled veggies but have a raw onion allergy, would I be able to substitute them with garlic? Hi Valerie, I’d probably just replace them with more carrots and cauliflower, and maybe double the garlic. Hi there, I’m making this recipe tomorrow and was reading through the comments. I have a suggestion: instead of the onions, why not use daikon radish? Or even plain old red radish? I’ve made my own “no recipe” quick pickle before and have had great success with the addition of thinly sliced cabbage, too. Honestly, I’m not a fan of herbs in my pickling liquid, but will give it a shot. I usually prefer just the sourness…suits my personality…;) thanks, Kate! Radishes would work well, too! I’ve been thinking about trying my hand at quick pickling lately and this just seems super duper do-able. Does the layering need to be done in a specific order? Oh, it’s so easy! I hope you’ll try this one. No, you can layer the veggies in any order you’d like. In hindsight, it might have been smarter to mix them all together before packing them in, so I could more easily grab a variety of them. This looks like such a good idea. I’ve never tried pickled carrots or cauliflower, but I want to now! Thanks, Heidi! Hope you love them. So completely delish! I adore having pickled veggies at the ready so I’m so excited to try this! Oh, these look like a Mexican version of giardiniera! And like giardiniera I bet they make everything they they top better. I am right there with you!! We had spicy asian style quick pickled veggies last night with dinner and I may or may not have had one alongside my lunch;) I am new to this pickling thing and always interested in trying new flavors! Mexican food and flavors are favorites around here, so these sound awesome!! Thank you for such a clever idea!! Also, I know you hear this all the time, but Cookie is just the cutest!! I used to HATE pickled vegetables, but now I absolutely love them! They have a really interesting flavor that you can’t really find in any other method of cooking. This is a great recipe for a new to pickling girl like myself! Looking forward to trying this out and seeing if I fare as well as you did! Thanks, Sam! Let me know how you like them! Kate, I must thank you for this recipe! I’ve been looking for a quick pickling liquid and I couldn’t find one that worked for me – they were either too sweet or too salty or too involved – and I was too lazy to work on tweaking one to my liking. I tried yours yesterday to pickle some okra (my friend had an abundance from his garden) and it is simply perfection! I subbed fresh dill for the bay leaf and oregano and that worked great. I’m SO excited to try this on other veggies now. THANK YOU! Yum, these sound great! I love quick pickled things because they are so easy and you don’t have to wait. 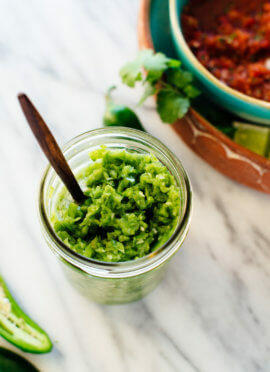 Have you ever tried fermenting your vegetables? It’s also very easy, but takes longer; you get the added benefit of beneficial bacteria! Here’s a really easy recipe that can be used with practically any vegetable, if you’re interested: http://spoiledtoperfection.com/recipe_fermented-carrots.php. Oh yum! These look great. I adore both pickled and fermented veggies. Definitely need to try this! I love that you pickled a medley of different vegetables – most people just stick to one vegetable per pickling project, usually cucumbers or carrots or onions. But seeing a medley with carrots, cauliflower and others is great! I can’t wait to try this at home. Thank you for the beautiful pictures to go along with the guide as well! Thank you, Billy! I’m glad you like the variety of veggies here. Just did this. Super simple recipe for the liquid and yet really yummy! I used cauliflower, red onions, tri-colored carrot coins, and shredded carrots. They’re cooling now and look so pretty. Thanks for the recipe! WOW!!! I am obsessed with those Trader Joe’s Spicy Pickled Veggies and this recipe NAILED IT!!! The only thing I changed for the liquid was using Coconut Sugar instead of the Maple syrup or honey. I am so so happy to have found this recipe. We don’t have a TJ’s near us so I know I’ll be making this a lot. I used Tri Colored Carrots, Cauliflower, Jalapenos, Yellow Onions and Jicama. Thank you so much for sharing this! I do 2 heads of cauliflower per batch and quadruple the recipe. I’ve made this several times now with white wine vinegar, red wine vinegar and apple cider vinegar. All are very tasty but the white wine vinegar batch has a cleaner, snappier and crisper flavor. I add other misc peppers to and a 1/4 tsp of red pepper flakes per quart jar of mix. Thank you, Wayne for your comment and review. Happy you liked it so much! Can you reuse the liquid part of the recipe with more fresh veggies? Do you need to reheat? I would recommend using new for this to ensure most pickled-ness. Hope that helps! Super Yummy. I was trying to think of how I could preserve my boyfriends much loved radishes for him while he’s out of state working. Thank you for this delicious recipe! Do you cover these with mason jar lids once you pour the hot liquid in? I’m wondering if the jar is too full and tight if it will explode on me! Thanks! Hi Kayla! You will want to let it cool first.